We here aim to establish that several quite independent databases are coherent and compatible. It will help to have read the previous article which evaluated the British-intelligence monthly decrypts data, comparing their figures with the Auschwitz Death-Books,and showing that they were in accord. We here additionally include a Nuremberg document which gave statistics on mortality through the German labour-camps over twelve months 1942-3, and does so in terms of percent monthly mortality, as alluded to above. By showing that these various databases are interlocking and compatible, we will in some degree discredit the Jewish ‘database in the sky’ concept, whereby it is averred that hundreds of thousands if not millions, of Jews arrived, were not registered but were gassed upon arrival, and then their ashes thrown into the Vistula – so no trace of them remains. A prudent use of Occam ’s razor is here required. The British wartime decryptions made at Bletchley Park give us the key to an authentic arithmetic. The Nuremberg document (a letter by Pohl, 4.9.43) evaluated monthly deaths as a percentage of the total inmates each month. For all camps, it divided total deaths by an average of the monthly total population. The lower (blue) graph shows this % figure as given at Nuremberg (the Table at the end shows the actual figures on which it is based). That overall camp monthly mortality from Nazi documents presented at the Nuremberg court, recorded a total of 224,000 inmates in all of the 16 German labour-camps it included, for August 1943. 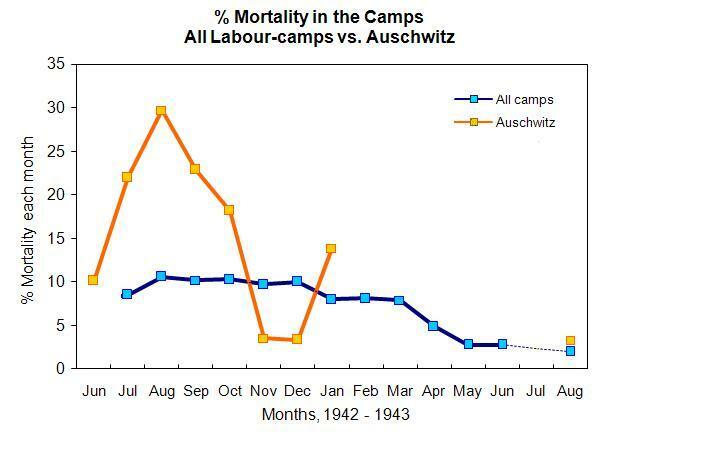 The higher graph shows my attempt to do something similar just for the Auschwitz camp, which was the biggest of all the labour-camps; the previous essay described how the awful peak of thirty percent mortality in August 1942 plummeted downward in Autumn and winter, as the ‘special treatment’ protocols started to take effect. A secondary typhus outbreak then struck in January-February 1943 and once more a total camp lockdown took place. The monthly averages of total camp inmates each month come from the British intel-decrypts, while the corresponding monthly deaths are counted from the Death Books of Auschwitz. We saw in the previous article how these both described the same group. Dividing one by the other gives the percentage. The Nuremberg document also gave us the respective monthly-death figures of Auschwitz in August 1943 as 3.0% for the men’s camp and 3.6% for the women’s camp -compared to the overall for all camps which came to 2.09 %, see graph. 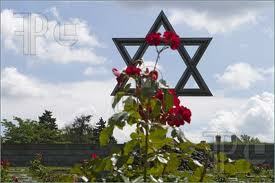 In that month of August 1943 the camps of Auschwitz and Birkenau (two miles apart) had 48,000 men and 26,000 women. That represents a huge increase in population from only seven months earlier, January 1943, when it had 25,449 men and 6,631 women. It is quite remarkable that, despite that increase, the % mortality has plummeted in that same period from 15% in January to just over 3% in August 1943. December 28, 1942: “The senior camp medical doctors will use all the means at their disposal to insure that mortality rates in the several camps decrease substantially. The camp medical doctors should supervise the nutrition of the prisoners more closely than before and submit proposals for improvements in conformance with the administrative measures of the camp commanders… The Reichsfuhrer SS has ordered that mortality absolutely must be reduced”.- SS officer Richard Glucks. In the first half of 1943 the death rate averaged 6% while in August 1943 it was only 2%, the letter said. (letter from Pohl, 4.10.43) A reply to Pohl’s report of 30 September 1943 congratulated him on the result achieved, and expressed the hope that improved sanitation and sewerage would yet further reduce the mortality. The British-intel decrypts surely offer the best possible perspective on this great endeavour, to obtain useful industrial labour from the camps, in 1942-43. The elimination of epidemic diseases from the camp was essential for this endeavour to succeed. 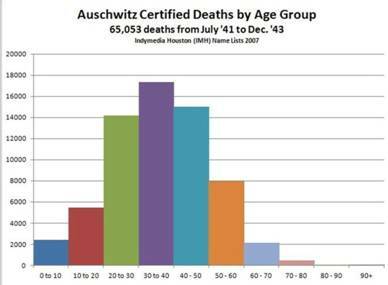 The graph shows us how Auschwitz had, over 1942-43, a far higher % mortality than the other camps. Many books by former inmates of Auschwitz have been published, emphasising the hellish conditions there. These statistics help us to appreciate the true horror of what the camp doctor Paul Kremer called ‘this Auschwitz hell:’ where dysentery, typhoid fever and typhus were raging. The ground at Auschwitz was too damp to bury corpses, owing to the two rivers nearby, so rotting dead bodies were lying around – plus people defecating whole time. More Catholics than Jews died? The total number of death-certificates recorded in the Death Books for Auschwitz, came to 68,800 with 29,100 Jewish and 31,800 Roman Catholic. There were quite a lot more Christian deaths than Jewish. The important point about these numbers, is that they are in proportion to the total camp numbers of inmates, and do not suggest any one religious/ethnic group was being targeted. Here is the age-distribution of deaths in the camp. 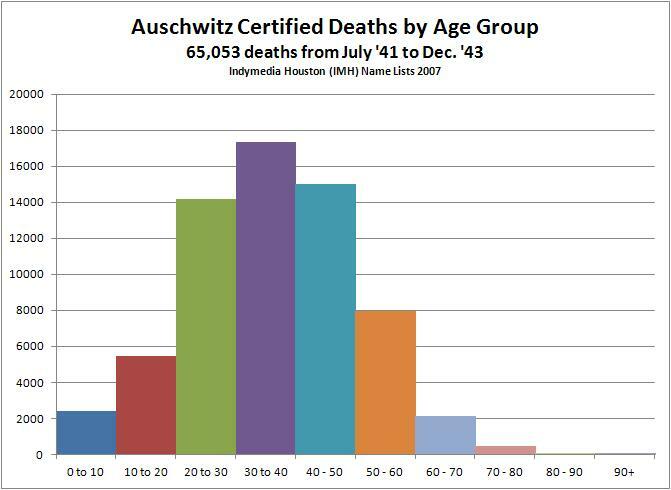 This tends to refute the numerous accounts of children, old folks and those unfit to work being sent ‘straight to the gas-chamber,’ because it shows a quite normal distribution of deaths, peaking around the age of 40. 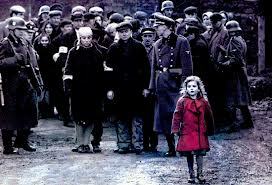 It is not compatible with the traditional concept of an extermination camp. There are some very old people, 80-90 years, in this distribution. The huge database of Bad-Arolsen in North Germany has also been recording all deaths in the German labour-camps, over the last sixty years. The database, built up by the International Red Cross, is nowadays called the International Tracing Service. It’s in some degree independent of the Death Books, because these were kept hidden in Russia until 1989. But it seems to have somewhat comparable numbers of labour-camp deaths recorded: both data-sources imply a comparable number of around thirty thousand Jewish deaths. Both have in common, of recording not one single death by gassing. Italic: single-day totals, where no monthly means were available. * F.Piper ( in his Auschwitz How Many Perished?, Jews, Poles and Gypsies, 1996, p.4,.) 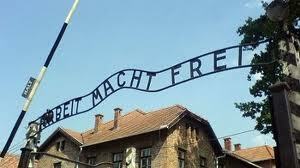 gave total Auschwitz inmates as 23070 for 1st June '42. That gives us a June figure (implying 8882 women, as there were then 14188 mean. * F.Piper has a chapter in the book ‘Anatomy of the Auchwitz Death-camp’ (Gutman and Berenbaum 1994) entitled, ‘The System of Prisoner Exploitation’ and he gives two figures of total inmate population: 29,306 for January 1943, and 42,742 for February 1943. That is a credulity-straining jump of twelve thousand in one month. But, his first figure agrees with the British decrypt data, adding the male and female totals for 4th January. * Carlo Mattogno Special Treatment p.65, cites Stärkebuch, analysis by Jan Sehn, states: ' In the month of July, 4,401 prisoners died, 4,124 of them in the men’s camp alone...' The men's camp in July had an average of 18,756 inmates, giving a 22% mortality. The Death-Books of Auschwitz, Vols 1-3, 1995; they are written in Polish, but Vol. 2 has a data-analysis chapter in English. At the Harvard Nuremberg site, select the IMT/NMT symbol PS and type in the number 1469 You should then arrive at a summary screen and if you click on the right arrow > next to 7 pages you should get several pages of the letter with table. Refs from Graf’s Giant with Feet of Clay, p.61. See Carlo Mattogno, Special Treatment at Auschwitz’ p.79, or pp75-81 for Kremer’s experience of the horror. ‘Unfortunately, we cannot reference a single document listing the death of a detainee due to gassing by Zyklon B. As a rule, the Nazis gave other causes of death for inmates, who perished in the concentration camps. With kind regards, U Jost, Archival Manager"– 2.11.06 letter to Mr Mannheim.